In the press release that you can read here, the researcher state that they can use the man-made living materials to conduct light or generate energy. Like live cells, the living materials are environmentally responsive, but also have all the traits of non-living particles. Lu said the practical, everyday uses for the research would be self-healing materials, solar cells, diagnostic sensors and more. The paper was published in the journal Nature Materials. 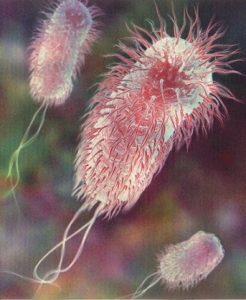 The researchers used mostly the E. coli bacteria for its naturally produced curli fibers biofilm. Curli fibers are proteins that stick E. coli to various surfaces, which is probably one of the things we don’t generally like about it, but they are useful for the project because they help retain non-living particles. The research team also demonstrated how the cells even appeared to communicate with each other, designing living materials that could coordinate the stimulation of each cell to control the composition of the biofilms. To quote Prof Lu again “It’s a really simple system but what happens over time is you get curli that’s increasingly labelled by gold particles. It shows that indeed you can make cells that talk to each other and they can change the composition of the material over time. Ultimately, we hope to emulate how natural systems, like bone, form. No one tells bone what to do, but it generates a material in response to environmental signals”. I like the bone analogy. Some months ago I visited another lab here in Cambridge where they use natural animal traits to design applications for science. You can read about my visit to the Karp Laboratory for Advanced Biomaterials and Stem Cell Based Therapeutics here, but the general idea is that researchers mimic the natural world. Lab Director Dr Jeffrey Karp explained that evolution offered incredible examples of innovation that could be used for scientific research today. We were shown examples of how porcupine needles are used to model surgical needles, and how gecko climbing techniques can be applied to medical adhesive design. I look forward to learning about possible applications. Makes me think of terminator 2 (or possibly 3) where the terminator rebuilds itself when damaged. Science fiction seems to be moving towards fact at quite a fast rate. Hopefully the medical technology that will come from these innovations will hit the market while I am still around to make use of it. “TARDISes were incredibly complex machines. The nature of their construction was such that they were said to be grown rather than constructed. Because computers were unable to withstand the reality-changing stress, TARDISes required morphologically unstable living organic matter, or protoplasm, for their Block Transfer Computations.” Source. I don’t know much about time and relative dimension space travel, but I know they can already use DNA for microchips.